Size: * Please selectLarge 3.5" X 1"Small 2.75"x5/8"
The design on these barrettes was inspired by a Mesa Verde Black-on-White repeating geometric design that was commonly used by the Ancient Puebloans dated A.D. 1150-1300. Large size 3 1/2" x 1", small size 2 3/4" x 5/8"
Handcrafted by Designs by Anna™ in Durango, Colorado. This particular design was inspired by a Mesa Verde Black-on-White bowl with an exterior decoration of double turkeys, dated A.D. 1200-1300. These pieces were inspired by a Mesa Verde black-on-white bowl. The design is a balance of hachured and solid elements, although not typical, is of Mesa Verde character dated A.D. 1150-1300. This design was inspired by a Black Mesa interlocking scrolls motif, dated A.D. 1025-1050. 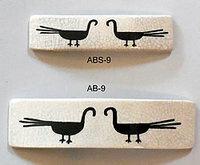 The design on these barrettes was inspired by a Mesa Verde Black-on-White repeating geometric design that was commonly used by the Ancient Puebloans from A.D. 1150-1300. This design was inspired by a Mesa Verde Black-on-White mug with interlocking scrolls motif, dated A.D. 1000-1200. This BookRug™ was inspired by a handowven Native American flatweave rug design from the American Southwest. The patent-pending urethane core is tear-resistant and if bent will return to its orginal flat shape. This bookmark features a photomontage of images from Cliff Palace and Spruce Tree House. Photographers —Bob & Suzanne Clemenz, George H. H. Huey and Tom Till. Dimensions 2.25" x 7"
This laminated bookmark displays a genuine U.S. stamp from 1934 featuring Cliff Palace on marbleized paper. The original 4¢ stamp was issued on September 25, 1934 to commemorate Mesa Verde National Park and was part of a set of ten stamps issued that year dedicated to major U.S. national parks. The bookmark colors are varied in earth-tones, golds, reds, blues or greens - please allow us to select a color for you. Approximate size is 1.75" x 5.5"
This collectible medallion displays the towers and kivas of Cliff Palace on the front. On the back is a unique State of Colorado emblem featuring the state bird, fish, mammal, and flower. Medallions are made out of .999 Fine Silver and are housed in a plexiglass collectors case. Made in the USA. This collectible medallion displays the towers and kivas of Cliff Palace on the front. On the back is a unique State of Colorado emblem featuring the state bird, fish, mammal, and flower. Medallions are made out of 90/10 Bronze, the highest quality of bronze on the market, and are housed in a plexiglass collectors case. Made in the USA. 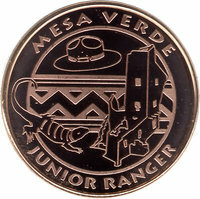 This collectible medallion features the Mesa Verde Junior Ranger logo on the front, and the kivas and towers of Cliff Palace on the back. These medallions are made out of 90/10 Bronze, the highest quality of bronze on the market, and are housed in a plexiglass collectors case. Made in the USA. This design was inspired by a Cortez Black-on-White bowl with interlocking scrolls, dated A.D. 900-1000. Surgical stainless steel earrings with ceramic pendants. Hancrafted by Designs by Anna™ in Durango, Colorado. 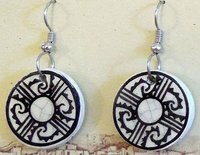 These earrings feature the iconic Mesa Verde Museum Association logo which was adopted from an Ancestral Puebloan Black-on-White bowl currently on display in the Mesa Verde Visitor's Center. 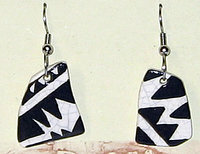 These triangle shaped dangle earrings were inspired by a Mesa Verde Black-on-White opposing triangle motife, dated A.D. 1200-1300. This design was inspired by a Cortez Black-on-White bowl, dated A.D. 900 - 1000. This design was inspired by a Cortez Black-on-White bowl, dated A.D. 900-1050. Handcrafted by Desigins by Anna™ in Durango, Colorado. This design was inspired by a Mancos Black-on-White bowl, dated A.D. 900-1150. Design inspired by Mancos Black-on-White typical triangle motif, dated A.D. 975-1175. 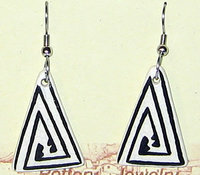 Surgical stainless steel earrings with cermaic sherd pendants. 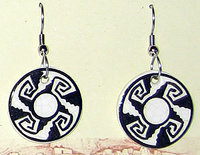 This design was inspired by Mesa Verde Black-on-White curvilinear design. this design may represent water and was commonly used by the Ancestral Puebloans from A.D. 1150-1300. This colorful hiking staff medallion features the towers of Cliff Palace. 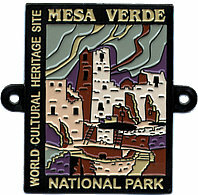 Text reads "Mesa Verde National Park" and "World Cultural Heritage Site". Comes with a set of three nails. Named for a large and intricate petroglyph panel, the Petroglyph Point Trail offers stunning views of Mesa Verde and is the only trail in the park to offer views of the petroglyphs. 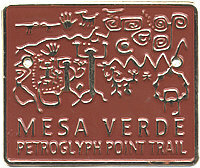 Text reads "Mesa Verde Petroglyph Point Trail". Comes with a set of three nails. 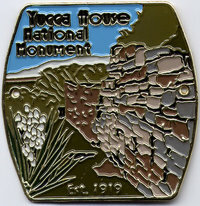 Hiking staff medallion featuring Yucca House masonry and blooming yucca plant. Text reads "Yucca House National Monument - Est. 1919". Comes with a set of nails. 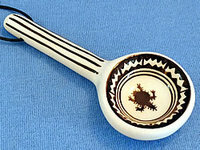 Inspired by a Mesa Verde Black-on-White ladle with a horny toad motif, housed at the Chapin Mesa Archaeological Museum. The first ladles were half-gourds. When pottery appeared the half-gourd was copied in clay. Ladles were no doubt used exactly as they are today- for dipping & pouring liquids of all kinds. This ladle comes with a waxed cotton loop making it a charming and whimsical Christmas ornament! Lead-free, microwave and dishwasher safe. Approximately 3" x 1". Handcrafted by Designs by Anna in Durango, Colorado. 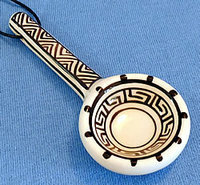 Inspired by a Mesa Verde Black-on-White ladle with a step-design motif, housed at the Chapin Mesa Archaeological Museum. The first ladles were half-gourds. When pottery appeared the half-gourd was copied in clay. Ladles were no doubt used exactly as they are today- for dipping & pouring liquids of all kinds.